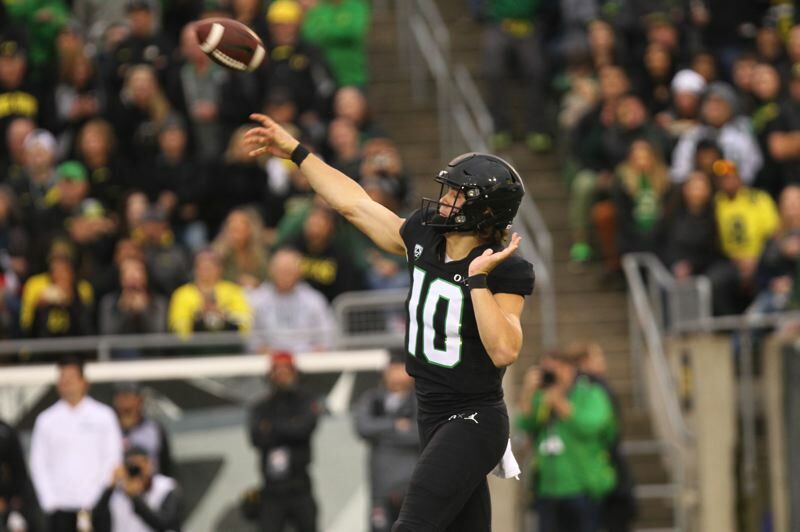 Names, numbers and reputation on paper are one thing, and how good the Oregon Ducks will be on the field in 2019 is quite another. The Ducks should sport a stacked roster, although tough games loom against Auburn at a neutral site to open the season and on the road against Stanford, Washington and USC in Pac-12 play. It'll be interesting to watch the development of the Ducks, who could return 17 starters, led by quarterback Justin Herbert, and have decent depth along with several ballyhooed newcomers, including defensive end Kayvon Thibodeaux. Will we see the talent turn into more wins and possibly a shot at the Pac-12 North Division title? Mind you, the Ducks (9-4, 5-4 Pac-12 this season) finished fourth in the Pac-12 North behind Washington, Washington State and Stanford in 2018, and it won't be easy to topple those programs and even reach the Pac-12 title game. Oregon did go 11 consecutive possessions without scoring against Michigan State in the Redbox Bowl — 10 punts, one knee before halftime — and the Ducks scored only seven points to beat the Spartans by one. (It epitomized a season of inconsistent offense). But a win is a win, and it came off the signing of a great recruiting class and an announcement by Herbert that he will be back. "Arguably one of the best players in America is coming back for his senior season," UO coach Mario Cristobal said during bowl week. Only receiver Dillon Mitchell leaves the offense; he has opted to try for the NFL. (Update: Linebacker Troy Dye also was deciding whether to turn pro but he opted to return for his senior season). "You always want to stack and layer your program from a recruiting and personnel acquisition standpoint, where you can have a junior- and senior-laden offense and defense, and now we have that opportunity," Cristobal says. "A lot of things really have fallen into place" with Herbert's decision. Cristobal was proud of how the Ducks worked through tough times in 2018, including losses to Stanford, Washington State, Arizona and Utah that included offensive droughts and put into question both the offensive leadership and the direction of the offense under Cristobal and coordinator Marcus Arroyo. Cristobal and his assistants and the players knew they were rebuilding the program, and they fought through the adversity. "It's not just talk and tough-guy chatter or whatnot. There's legitimate meat to it," Cristobal says of the rebuilding mentality. "I think it's paid big-time dividends." Cristobal understands that the Ducks need to work out some kinks on offense. "I think you'll see us evolve more," he says, especially with Herbert coming back (3,151 yards, 29 TDs, only a 59.4-percent completion rate as a junior). Cristobal's Ducks are committed to being a power-run team, first and foremost, but more talent could lead to a different offense. The list of offensive returnees should have Duck fans excited. It includes running backs Travis Dye and CJ Verdell (1,018 yards, 12 total TDs in 2018), tight end Jacob Breeland and five offensive linemen (including stud tackle Penei Sewell). It'll be imperative for the Ducks to develop wide receivers, particularly because Mitchell stood out in 2018 (75 catches, 1,184 yards, 10 TDs). Recruited players such as Joshua Delgado and Mycah Pittman and redshirt freshman Bryan Addison could add to the talent on the outside. The defense improved under coordinator Jim Leavitt, again. It allowed 25.4 points per game (giving up only 21 total points in the last two games). A lot of players return: Troy Dye, Jordon Scott, Austin Faoliu, La'Mar Winston, Thomas Graham, Deommodore Lenoir and others. Three incoming linebackers (Dru Mathis, Mase Funa, Ge'Mon Eaford) could be a factor next season, as could top prep cornerback Mykael Wright. But clearly, the big get from the December 2018 recruiting class should play right away. The 6-5, 245-pound Thibodeaux, ESPN's No. 1-ranked player from Westlake Village, California, is "a game-changer at the defensive end," Cristobal says, "a guy that can play the run and knock back tackles and tight ends and disrupt the offense, get in the backfield and create negative plays. And on any passing situation, especially third down, here's a guy that can change you significantly." So, the Ducks could take the leap to Pac-12 contender in 2019. The season doesn't start easy, with Auburn at AT&T Stadium in Arlington, Texas, on Aug. 31. The Tigers, coached by Gus Malzahn, scored 63 points in their bowl game (a 49-point win over Purdue), and reportedly return many key players from an 8-5 season (although they'll need to groom a new QB). The Ducks play at Stanford (Sept. 21), Washington (Oct. 19) and USC (Nov. 2). All of those foes will have talented quarterbacks — K.J. Costello (Stanford), Jacob Eason (Washington) and JT Daniels (USC) — and playing on the road still could be hairy for the Ducks, who topped only California and Oregon State away from home in 2018.